And THIS my friends, is what we've been waiting for. Wild, couture, crazy, impractical, out of the box wedding fashion ... yes, FASHION. Not wedding dresses, not wedding gowns, but wedding fashion. This is couture AF. 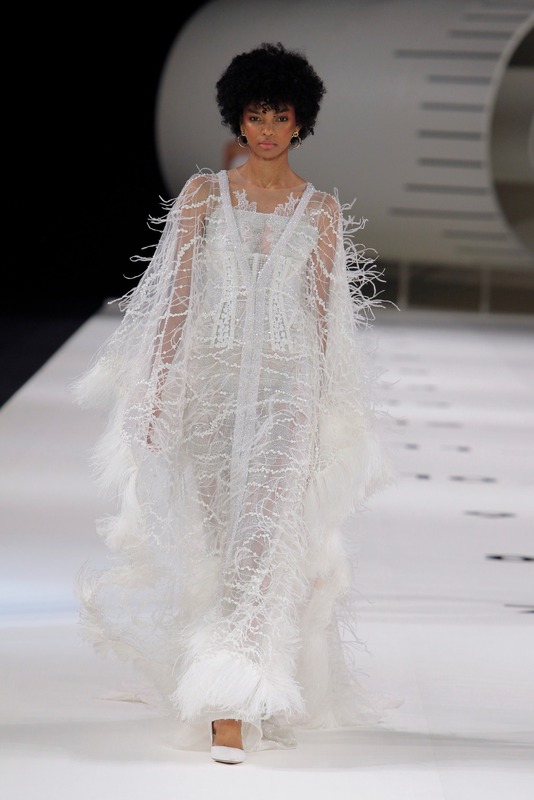 The Couture (duh) brand YOLANCRIS showed the new 2019 #IDENTITY collection earlier this week in Barcelona, which in fact, has always inspired the collections. This amazing show was open to the public. YOLANCRIS had a huge audience and took couture to the damn streets. Under art direction of the theatre company La Fura dels Baus they recreated the symbolism of couture in big; giant scissors, needle cushions and even a thimble that served as atrezzo in this magnificent catwalk, where the last proposals from Yolanda Perez – Creative Director – and her team were shown. Later that evening, the Montjuïc Magic Fountains were lit and served as a dramatic background. Models walked #IDENTITY, (collection inspired by the great female icons from Grace Jones to Marchesa Casatti). Sound about right with the current state of female empowerment. Appealing to our millennial brides, the collection included sweatshirts and pants (ok people, sweats aren't just for millennials). As the grand finale, a majestic bride wore a long veil with strong reminiscences of Gustav Klimt and and the iconic “Y tu mirá” from Lole and Manuel song was playing. Just scroll down and you'll feel a handmaid vibe. No joke. #IDENTITY combines all the styles, ALL OF THEM. With Spanish celebs such as Hiba Abouk, Patricia Montero on hand as well as influencers like Miranda Makaroff and Alessandra Grillo. These fab females were of course the main guests of the first row. This is why we love YOLANCRIS. Just straight up style. Look at those boots, the cross-wrapped mummy mini and uggg I want those glasses. Getting a little futuristic with this get up, how can you not love to look at this? Feathers and beads and do I spy a corset under there? Here's the cross-wrapped mummy mini with a bubble skirt and well, put a bow on it of course. More please. Well, this is stunning. So whimsical and a lot of what were seeing from other designers as well. You know who I'm talking about, if not refresh your memory. Kaftan style wedding dress. Why not? No reason. This isn't your mom's wedding dress, now is it? Statement shoes with this darling high low gown are perfect and YOLANCRIS brings new meaning to flower crown. You know what I'm going to say ... a handmaid if she got married.